I cannot conceal my admiration for Marc Simonetti’s talent and art, not that I am attempting such a thing. Each new artwork and book cover born from Marc Simonetti’s brushes tends to lose me in contemplation and each one manages to fascinate me in one way or another. 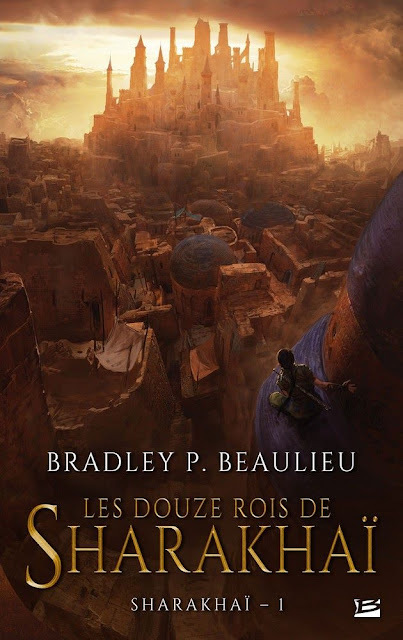 I have two fresh examples to keep the fire of my appreciation for the work of this wonderful artist burn brighter, the covers for Rachel Neumeier’s “The Mountain of Kept Memory” (coming in November from Saga Press) and the French edition of Bradley P. Beaulieu’s “Twelve Kings in Sharakhai” (“Les Douze Rois de Sharakhaï” published by Bragelonne). Both share the same design, one that Marc Simonetti used before, the perspective over a city. In the case of “Twelve Kings in Sharakhai” Marc Simonetti’s artwork is similar to the US cover only to have an ampler vision and a more encompassing perspective. On both these covers the panorama envisioned by the artist and his playing on the light have the effect of stirring the viewer’s curiosity and the desire to visit these places, at least with the help of imagination until the books open further these worlds. There is one more thing stimulating the desire to discover more about these places, the characters. Not only do we see the cities from a distant witness point of view, but from the way the characters are positioned on the cover we share that vision with them too, moving us closer to the scene and creating an initial connection with the personages. And the characters, like the settings, remain to be discovered within the pages of the respective books. In this gorgeous fantasy in the spirit of Guy Gavriel Kay and Robin McKinley, a prince and a princess must work together to save their kingdom from outside invaders…and dangers within. Gulien Madalin, heir to the throne of Carastind, finds himself more interested in ancient history than the tedious business of government and watching his father rule. But Gulien suspects that his father has offended the Kieba so seriously that she has withdrawn her protection from the kingdom. Worse, he fears that Carastind’s enemies suspect this as well. Then he learns that he is right. And invasion is imminent. Meanwhile Gulien’s sister Oressa has focused on what’s important: avoiding the attention of her royal father while keeping track of all the secrets at court. But when she overhears news about the threatened invasion, she’s shocked to discover what her father plans to give away in order to buy peace. But Carastind’s enemies will not agree to peace at any price. They intend to not only conquer the kingdom, but also cast down the Kieba and steal her power. 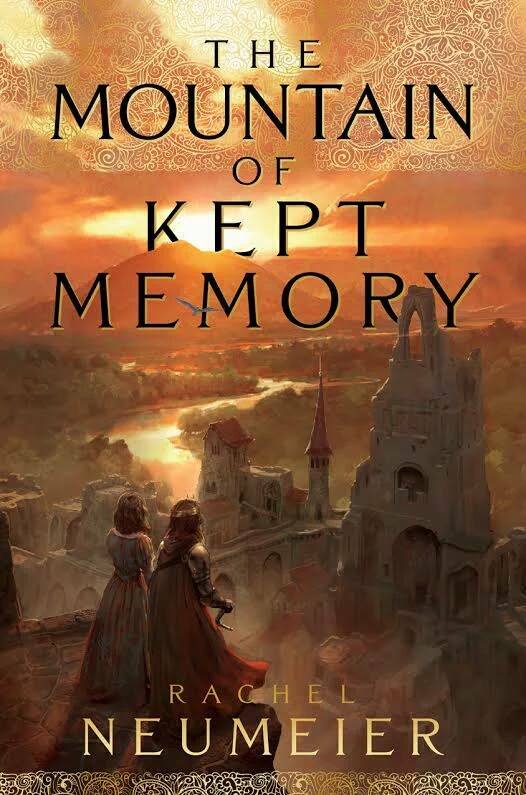 Now, Gulien and Oressa must decide where their most important loyalties lie, and what price they are willing to pay to protect the Kieba, their home, and the world. 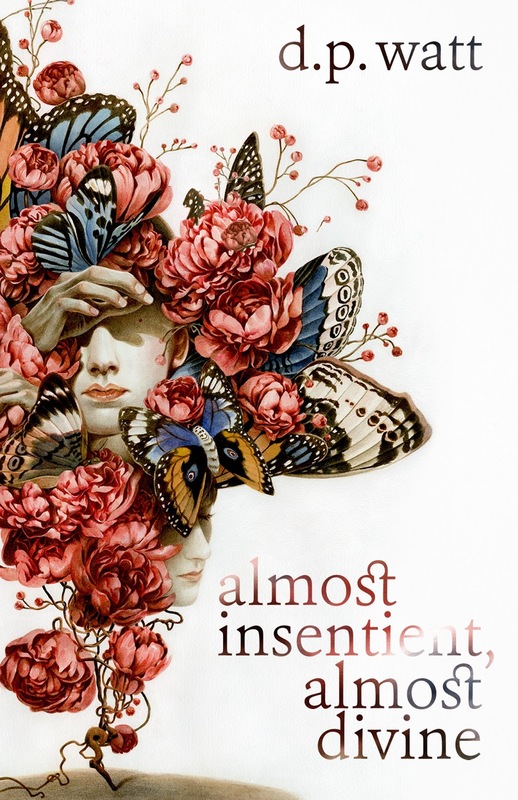 Last year, I had the pleasure to host a guest post, “What Flavour of Apocalypse”, by Tsana Dolichva during the crowdfunding campaign for “Defying Doomsday”, an anthology she was about to edit together with Holly Kench. After the success of the said crowdfunding campaign the reading and selection process started and now we are moving one step closer to the publication of “Defying Doomsday” as Tsana Dolichva and Holly Kench revealed the stories chosen out of the 177 submitted tales for this apocalypse-survival anthology. “Defying Doomsday” is due to be released by Twelfth Planet Press in mid 2016. 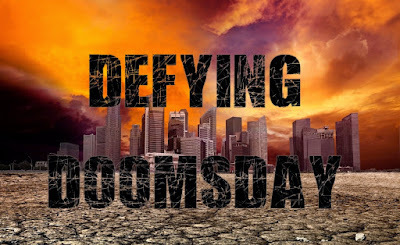 Defying Doomsday is an anthology of apocalypse fiction featuring disabled and chronically ill protagonists, proving it’s not always the “fittest” who survive - it’s the most tenacious, stubborn, enduring and innovative characters who have the best chance of adapting when everything is lost. 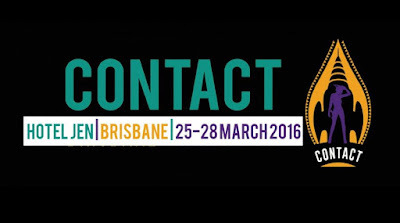 The preliminary ballot for the 2016 Ditmar Awards has been released. The winners will be announced during the 2016 Australian National SF Convention, Contact, due to take place between March 25th and 28th at the Hotel Jen in Brisbane. I admire greatly the work, dedication and innovation put together by small, independent book publishers. I learned over time that more often than not such publishers take me outside my safety zone, push me towards the discovery of new, engaging fiction and talented writers. 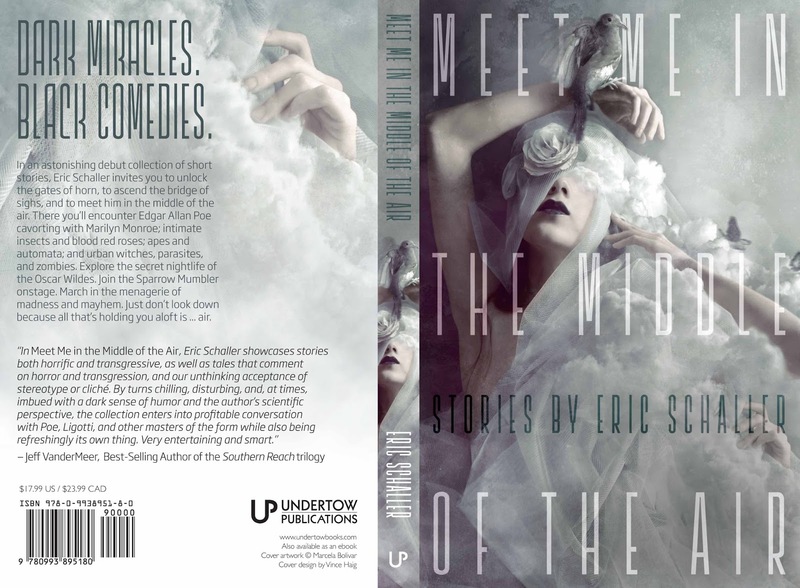 Undertow Publications is one such small press, with quite an impressive body of work that it’s not easy to ignore. 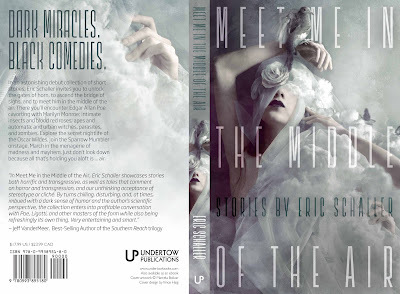 Publishing and supporting mostly weird, short fiction Undertow Publications started with the “Shadows & Tall Trees” magazine that saw the appearance of 6 issues, followed with “Year’s Best Weird Fiction”, which will see its third volume published this year, and anthologies or author collections of short stories such as “Aickman’s Heirs”, edited by Simon Strantzas, and V.H. Leslie’s “Skein and Bone”. 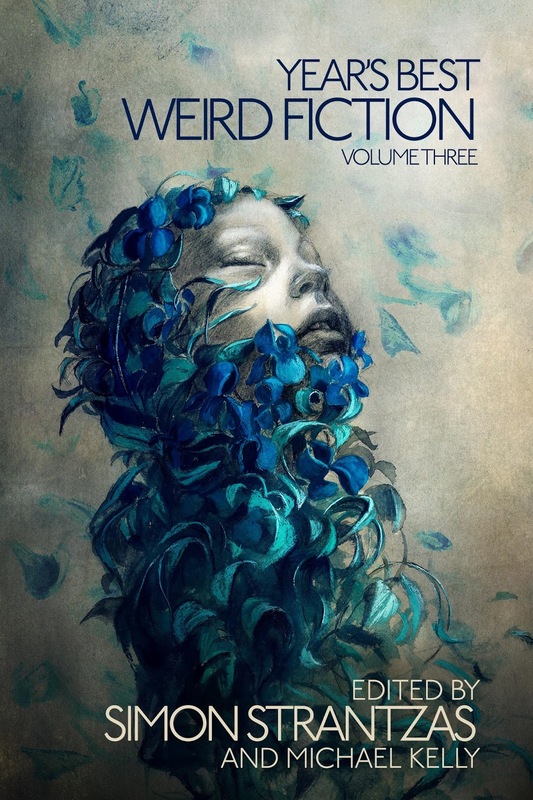 This year Undertow Publications plans to add 4 more books to its catalogue, the already mentioned “Year’s Best Weird Fiction, Volume 3”, coming on October, and three collections of short stories, Eric Schaller’s “Meet Me in the Middle of the Air” (scheduled for February), Sunny Moraine’s “Singing With all My Skin and Bone” (due to be released on June) and D.P. Watt’s “Almost Insentient, Almost Divine” (published on July). I must admit that I already own most of Undertow Publications’ back catalogue, with the majority of them being read, and that the future releases are very tempting for me. They are even more appealing when taking into consideration the subscription offered by Undertow Publications, pre-ordering all the 4 trade editions of these books comes with a 25% discount and that means 69$ for all the 4 volumes and the shipping, worldwide, is included. If you are interested or want to take a further look at this offer you can find all the details on the Undertow Publications’ website. 2015 proved to be extremely busy, it leaned so heavily on the busy side that it stretched thin my energy, motivation and inspiration. Sadly, 2016 wasn’t up for a good start either. Actually, if I had any quarrels with the past year I didn’t anticipate the beginning of the new one. Still, it also brought revitalization, dealing with some difficult situations I regained the great pleasure of sitting down and settle on a reading, the desire of talking about all the good books and the authors who write them. Not that I lost this passion, but I discovered that for the past several months it dwindled. So, although the first month of this new year didn’t bring many reasons for optimism I find myself ready to talk again about the great world of speculative fiction. I don’t have any specific goals in mind, for the time being I just wish to set the wheels in motion again and detect where this path leads me. I hope you had an excellent start of the year though and will see each other around here as much as possible.